Today is Arbor Day, the annual international celebration of trees. Like my distant heathen ancestors, I partake in a bit of tree worship. 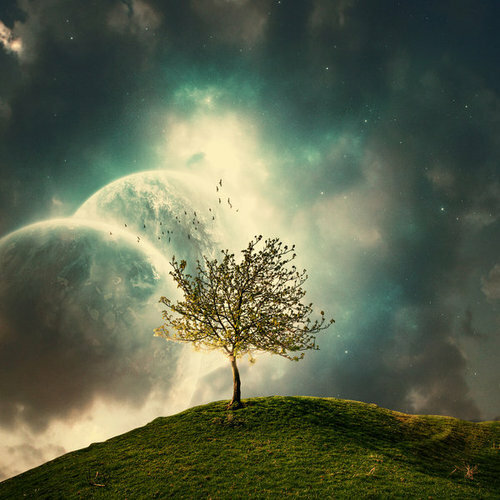 Because of their immense size, strength, beauty and longevity, trees are an obvious metaphor for the numinous. 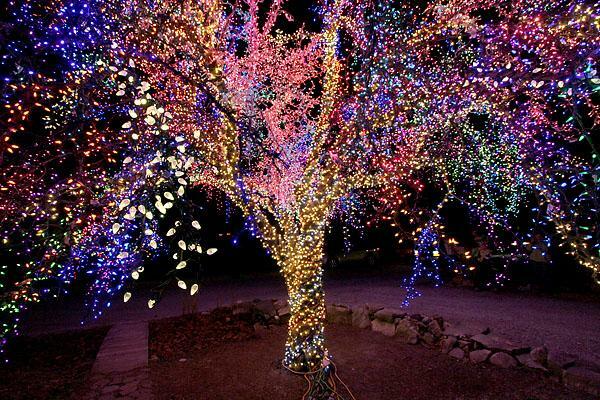 However there are also more subtle and compelling reasons that trees are the ideal symbol of divinity. Trees are at the center of a vast web of commensal relationships between living things. They rely on large mutualistic collections of organisms to survive. 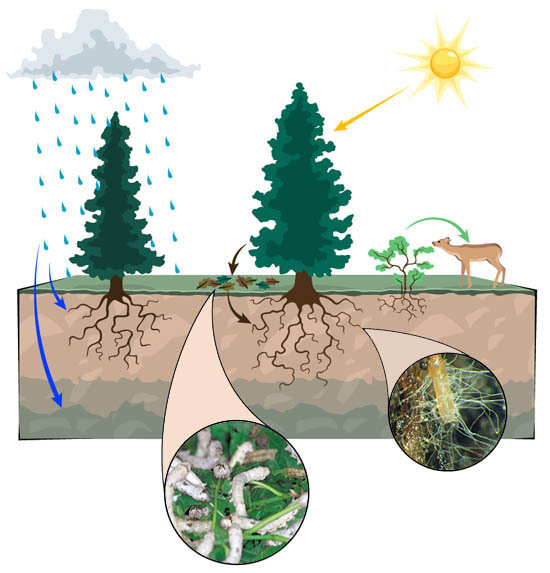 Trees cannot live without an unseen world of symbiotic organisms in the soil. The towering plants rely on nitrogen fixing bacteria, fungi, and actinomycetes to take nutrients from the earth. Likewise trees communicate through fungal networks which link them together in improbable ways we are only now learning about. Trees utilize bees, flies, monkeys, and birds for pollination…and to disseminate their seeds. They call on different parasitoid wasps for defense through elaborate biochemicals. We should really envision a tree not as a big spiky discreet thing sitting in the lawn, but as a vast flow chart/rolodex of connections with other living organisms. 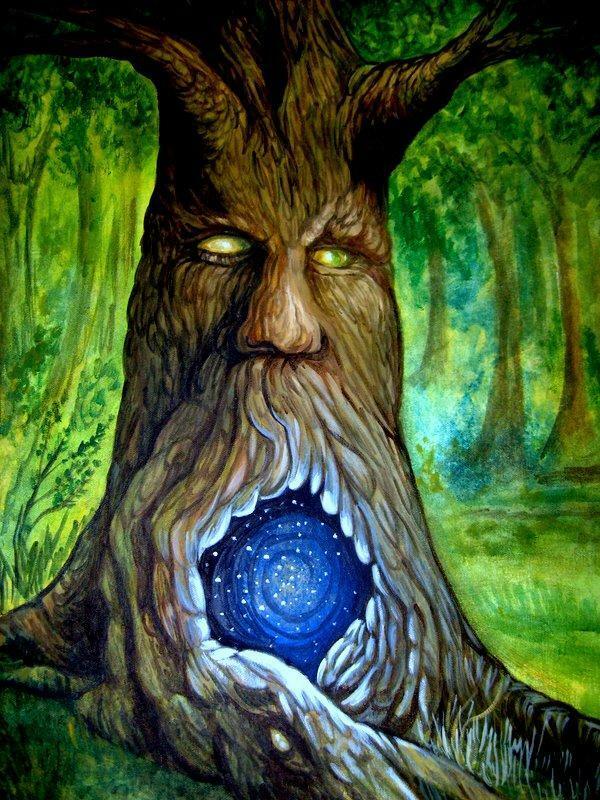 Of course trees are not unique in being an interconnected node within a vast web of life—that is really the way all life is. It is a grotesque human conceit that humans stand outside and above nature. I have always thought of humanity as a problematic youngest child. We are the favorite (for the moment). We have such gifts…but we are so arrogant, unhappy, and unstable. And we are so so monstrously greedy. I sometimes like to imagine trees as a gentle stable elder brother. Actually though, mammals are much older than flowering trees. For hundreds of millions of years our pathetic little ancestors cowered beneath the roots of conifers, cycads, ginkgoes, tree-ferns and such. Then, at the end of the Mesozoic, the ascent of mammals happened at the same time that the angiosperms took over the land. Our shrewlike ancestors evolved into arboreal primates as the angiosperms themselves were becoming the forests. We grew up together! While the great angiosperm forests of the Eocene may not have required much from our squirrel-like grandparents, today’s forests desperately require our good graces so that they are not all converted into parking lots. Plywood, and ugly discount furniture. Anyway, my thoughts are getting away from me. I only wanted today’s post to be a reminder of Arbor Day and how wonderful and beautiful trees are. 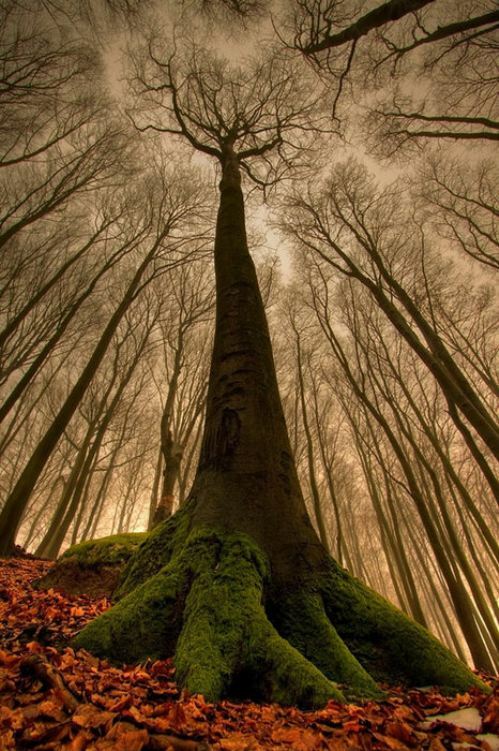 Here is a small gallery of lurid yet evocative images of sacred trees! 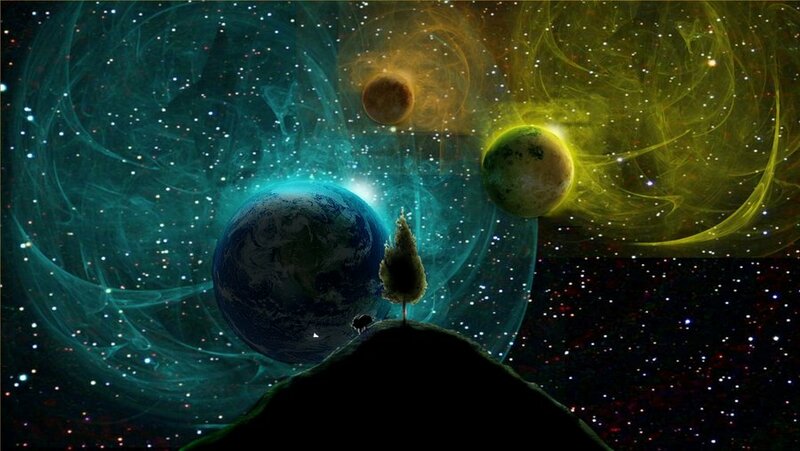 I especially like the pictures of trees together with outer space or the cosmos (like the big portal tree at the top). Happy Arbor Day! …they say that Bacchus discovered honey. With the cymbals clashing in his companions’ hands. Bees, that follow after the echoing bronze. And was rewarded with the prize of discovering honey. They searched for the yellow combs in every tree. As you have probably apprehended, there is a theme to my posts this week about the ambiguous line between the wild and the domestic–a tension which forever pulses within all human thought and endeavor. Humans are animals. 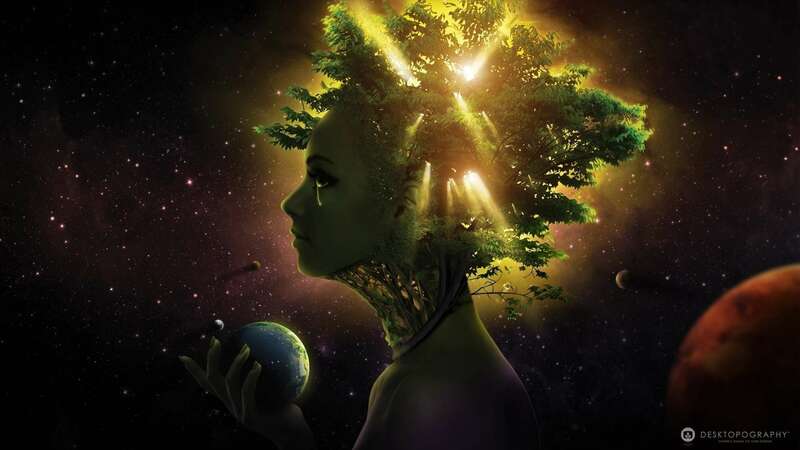 We came from nature and can never ever leave it. We continuously long for the natural world in our aesthetic and moral tastes—our very idea of paradise is a garden of plants and animals. Yet the social and technological forms humans create often seem entirely at odds with the natural world. Our fishing fleets destroy the life within the oceans as they provide us with the wild fish we long for. Our cities poison and strangle the beautiful estuaries where we build them. As our hands reach toward the divine and the celestial, our feet break apart the earth we sprang from. I’ll write further about that point (indeed I don’t believe I have ever left off examining it), but for right now I would like to discuss The Discovery of Honey by Bacchus, a painting which symbolically explores the juxtaposition between wild and domestic. 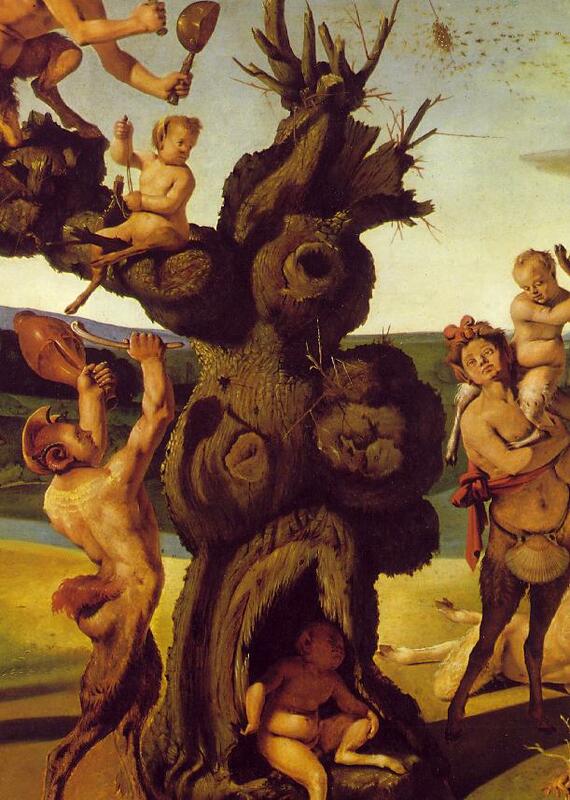 The work was created by that consummate oddball visionary, Piero de Cosimo, who disliked wielding fire and refused to clip the trees in his orchard because he felt that doing so contravened the will of nature. Vasari relates that de Cosimo would sometimes abandon himself to the wilderness and was more beast than man (also the artist seems to have suffered from emotional illness). Yet, within this painting de Cosimo presents that moment when bees were first gathered from the wild and kept for the purpose of honey production. It was a step away from an imagined era of wildness towards an agricultural era when sweetness and plenty became available to all. In The Discovery of Honey, a group of satyrs have found a hive of bees swarming within a strangely human stump. Together with Silenus, a bumptious fertility god, they are beating eccentric implements to gather the swarm so it can be collected. On the right side of the painting Bacchus and his coterie stand amidst forests and ravines beneath a glowering monadnock. 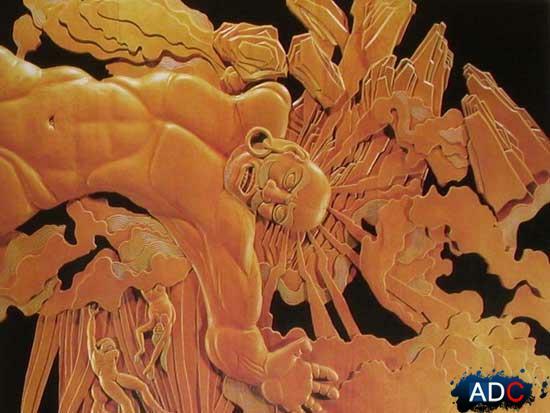 A satyr carries a woman away into the wild while savage beast-men tear apart a carcass and climb off into the trees. 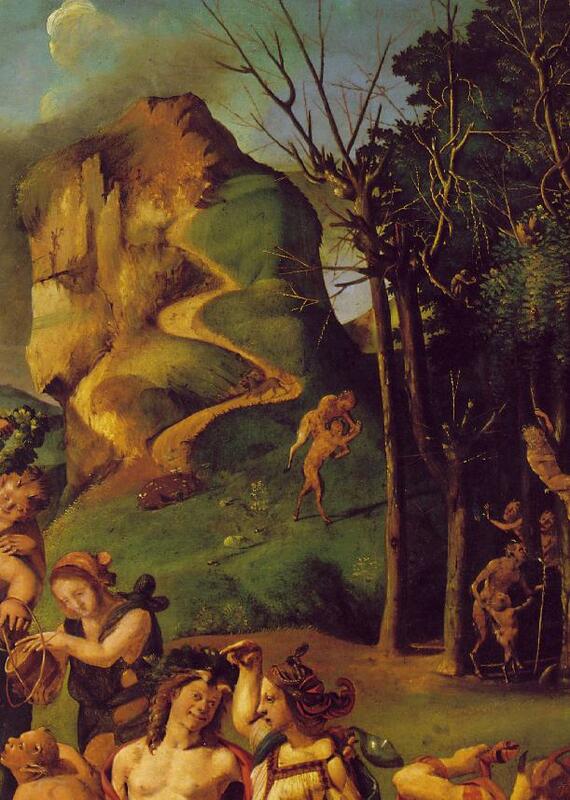 On the left side of the painting, people and fauns bearing iron and pottery march towards the stump from a surprisingly sophisticated town with an elegant campanile. In the center the bees swarm into a knot as a human-hybrid child pops out of the yonic rift within the torso shaped stump. What is going on here? This painting has remained an enigma to scholars since its creation. Many critics have opined that the right side of the work represents wilderness and the works of the gods while the right side represents society and the works of humans. Wilderness and civilization meet at the point where the bees are captured and honey is discovered. 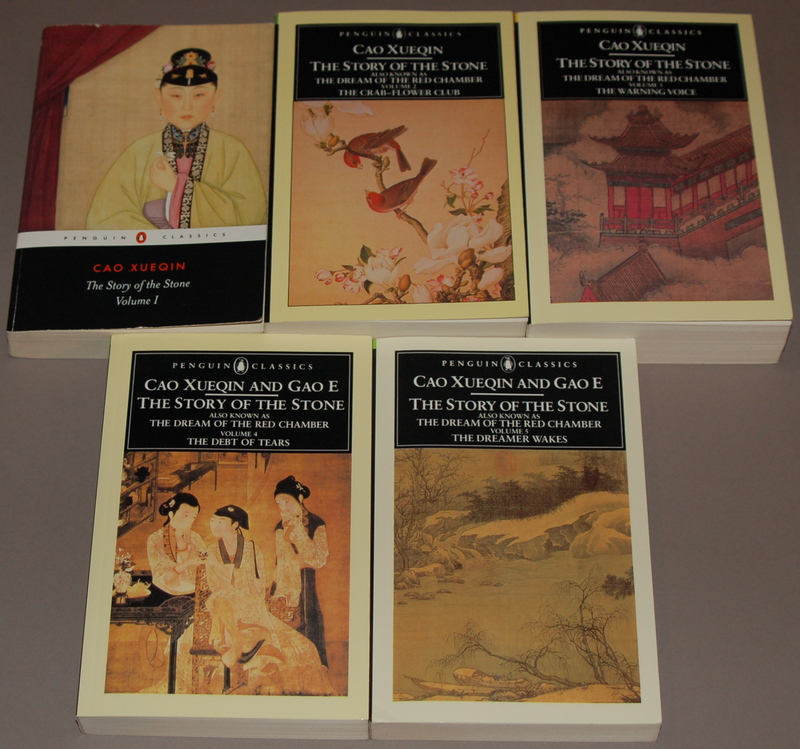 This interpretation is undercut by the half-human status of the characters on both sides. Another interpretation holds that the painting represents the symbolic discovery of fertility—metaphorically represented by honey. 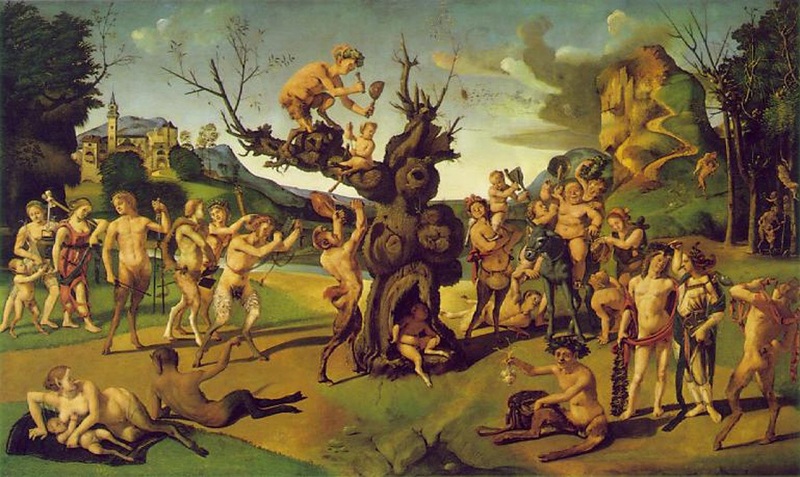 The painting’s composition certainly supports this concept: the nursing faun, the baby satyr in the center of the painting, and the satyr spontaneously offering onions (a fertility offering of Greco-Roman society) are all fertility symbols, as our numerous other more overt figures within the painting! This is the Ferrebeekeeper’s 300th post! Hooray and thank you for reading! We celebrated our 100th post with a write-up of the Afro-Caribbean love goddess, Oshun. 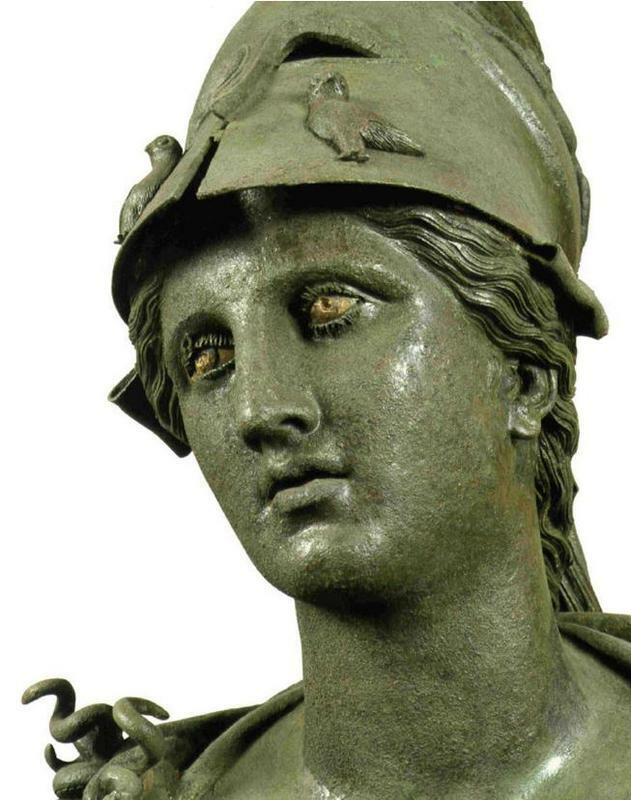 To celebrate the 300th post (and to finish armor week on a glorious high note), we turn our eyes upward to the stern and magnificent armored goddess, Athena, the goddess of wisdom. 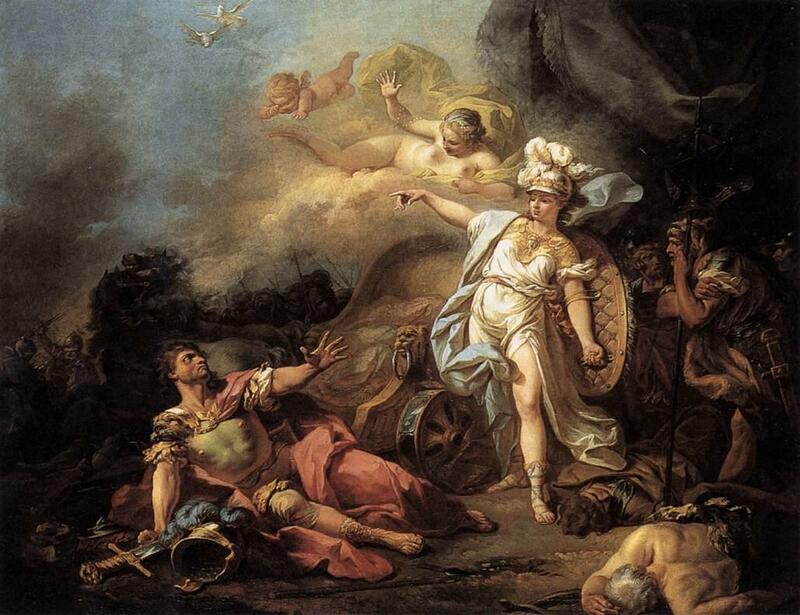 Athena’s birth has its roots in Zeus’ war with his father Cronus. 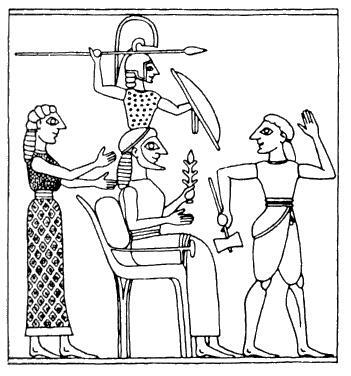 In order to win his battle against the ruling race of Titans (and thus usurp his father’s place as the king of the gods), Zeus married the Titan Metis, goddess of cunning and prudence. 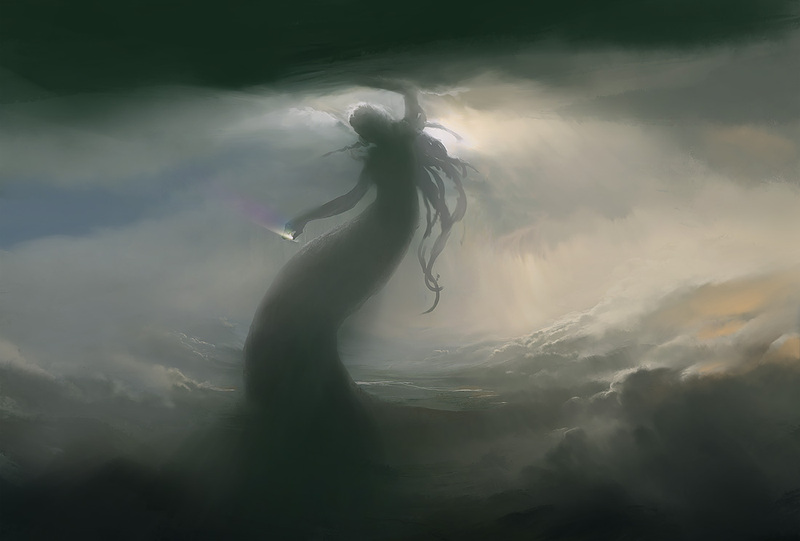 Her wise counsel and crafty stratagems gave the Olympian gods and edge against the Titans and the latter were ultimately cast down. Metis was Zeus’ first wife and the secret to his success… but there was a problem. It was foretold that Metis would bear an extremely powerful offspring: any son she gave birth to would be mightier than Zeus. To forestall this problem Zeus tricked Metis into transforming into a fly and then he sniffed her up his nose so that he could always have her cunning counsel inside his head. But Metis was already pregnant. Inside Zeus’ skull she began to craft a suit of armor for her child to wear. The pounding of her hammer within his temples gave Zeus a terrible headache. Insane with pain, Zeus begged his ally Prometheus (the seer among the Titans) to cure him of this misery through whatever means necessary. Prometheus seized a labrys (a double headed axe from Crete) and struck open Zeus’ head with a noise louder than a thunderclap. In a burst of radiance Athena sprang forth fully grown and clad in gleaming armor. Athena was Zeus’ first daughter and his favorite child. For his own armor, Zeus had carried an invincible aegis crafted out of the skin of his foster mother, the divine goat Amalthea. When Athena was born he handed this symbol of his invincible power over to her. 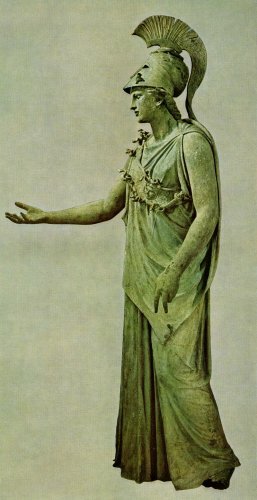 Similarly throughout classical mythology Athena is the only other entity whom Zeus trusts to handle his lightning bolts (there is an amazing passage in the first lines of the Aneid where she vaporizes Ajax’s chest with lightning, picks him up with a whirlwind, and impales him on a spire of rock in revenge for an impiety). Her other symbols were the owl, a peerless predator capable of seeing at night, and the gorgon’s head, a magical talisman capable of turning humans to stone (which Athena wore affixed to her armor). Although she was first in Zeus’ esteem, Athena did not forget her mother’s fate and she remained a virgin goddess who never dallied with romance of any sort. 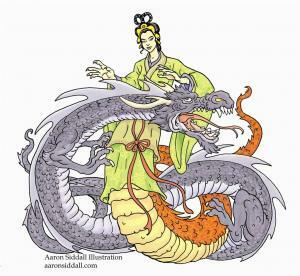 Wisdom, humankind’s greatest (maybe our only) strength was Athena’s bailiwick as too were the fruits of wisdom. Athena was therefore the goddess of learning, strategy, productive arts, cities, skill, justice, victory, and civilization. 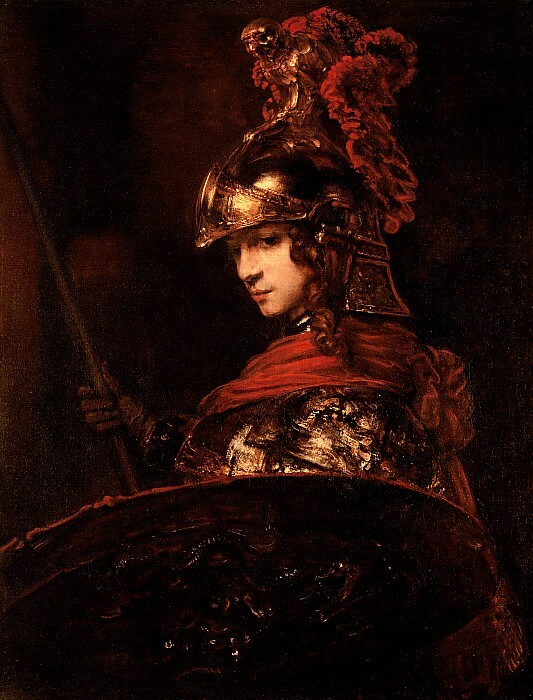 She is often portrayed as the goddess of justified war in opposition to her half-brother Ares, the vainglorious deity representative of the senseless aspects of war. In classical mythology Athena never loses. Her side is always victorious. Her heroes always prosper. She was the Greek representation of the triumph of creativity and intellect. Metis never bore Zeus a son to usurp him–but when I read classical mythology such an outcome always seemed unnecessary. Not only did Athena wield Zeus’ authority and run the world as she saw fit, but Zeus was perfectly happy with the arrangement (a true testament to her wisdom). 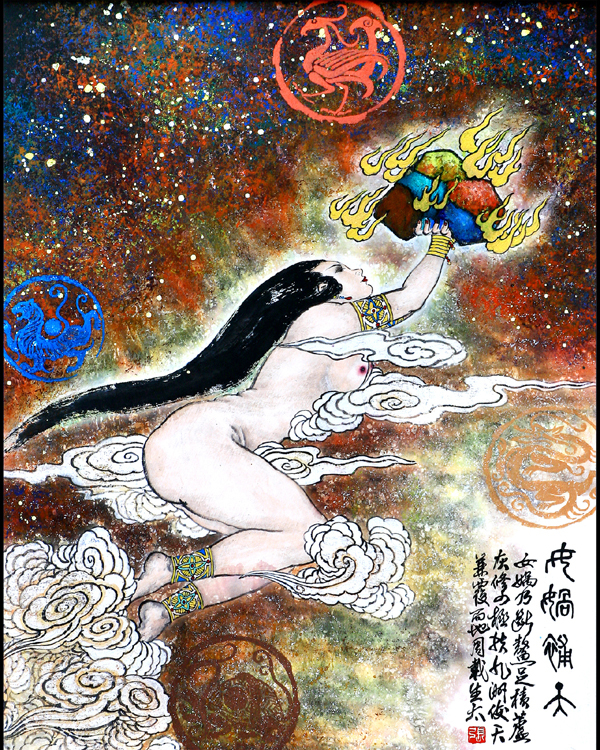 The one slight to the grey eyed goddess is that she does not have a planet named after her (nor after her Roman name Minerva), however I have always thought that astronomers have been secretly saving the name. 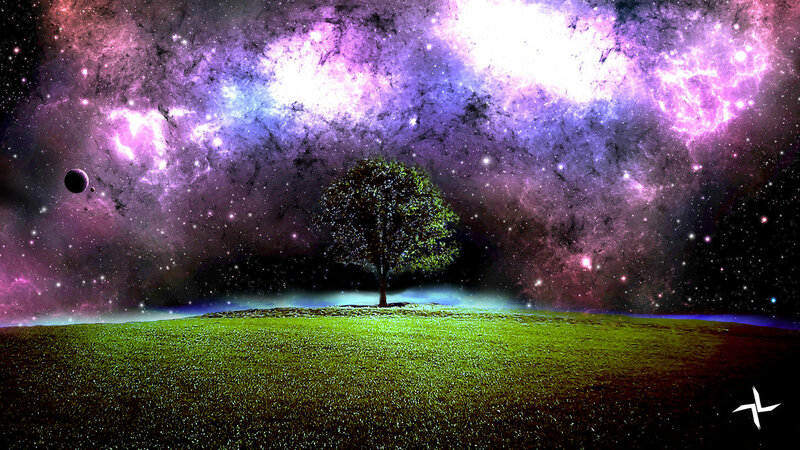 We can use it when we find a planet inhabited by beings of greater intelligence, or when we travel the stars to a second earth and apotheosize into true Athenians.